We should be honest about the Communist Party of the Philippines’ record, including its assassinations of left-wing activists. The Communist Party of the Philippines cadre in 2016. Denis Rogatyuk’s interview with José Mariá Sison is remarkable for what it does not address. Among the issues the article ignores are the Communist Party of the Philippines’ (CPP) history of killing its leftist critics, and Sison’s part in this policy of murder. As a representative of the NDF, an organization under control of the party, Sison has always fully supported the actions of the CPP. From their side, the party pays respect to him as the ideologue of their movement. The CPP’s politics are those of Sison, and vice versa. Sison is not the sole leader of the CPP but no matter his official status, he still has considerable influence over it. Today, this organization is very different from what it was in its heyday, in the mid-eighties. During the nineties, the CPP went through a series of acrimonious splits after the faction around Sison blocked the organization of a party-congress and ended debates over political strategy by imposing a return to Maoist orthodoxy. When it stabilized at the end of the decade, the party was much more homogeneous and tightly organized than before. It was during this decade that the CPP started its policy of assassinating other leftists and former members. Dozens of assassinations have been recorded. 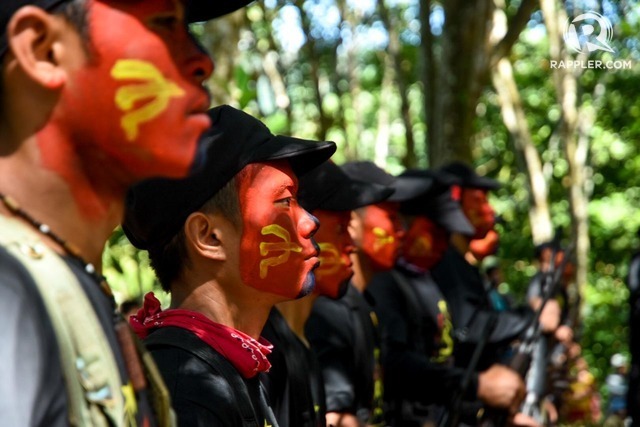 Most of them happen in the remote areas where the CPP’s armed wing, the New People’s Army (NPA), is strongest. Information is difficult to gather, and people are afraid to come forward, especially when they lack the protection of a strong organization. Better known are the killings in 2008 of several peasant activists linked to the social-democratic Akbayan Party. Other victims included members of the Maoist Marxist-Leninist Party of the Philippines (MLPP), the Revolutionary Workers Party-Mindanao, and other groups. Around 2005, the issue attracted international attention. Around that time, the CPP killed a number of prominent former members and published an overview of so-called “counterrevolutionaries” in the Philippines and their supposed international links. The list included most of the non-National-Democratic Philippine left. Some of the people mentioned had already been killed, but others are still alive, among them the well-known activist Walden Bello. The killings and threats were condemned, among many others, by international organizations such as some 140 participants at the Word Social Forum, and Focus on the Global South. The European United Left-Nordic Green Left group in the European Parliamentary broke its links with Bayan Muna, the National-Democrats’ most prominent parliamentary organization. These protests forced the CPP to stop targeting well-known, aboveground, figures of the broad left. But local and underground cadres are still at risk. Today, in the southern island of Mindanao, which is under martial law, specifically peace activists in indigenous communities are under threat from both the army and the NPA. Sison and the NDF continue to claim the CPP has a right to sentence people in its “people’s courts.” They justify the killings with unproven accusations that often blend together charges of complicity with government forces, ordinary crimes, and personal attacks. Their response to international criticism is similar. Rousset, for example, was accused of cooperating with the CIA. The killings perpetrated by the NPA are the most serious elision, but the interview omits other crucial questions as well. One example: there is an allusion to Sison suggesting Philippine president Duterte could be a Chávez-like figure. But Sison was not just simply wrong in his assessment of what Duterte’s presidency would be like — he helped to bring it about. During the campaigning period, Sison spoke highly of Duterte, claimed a Duterte presidency would be good for “national unity” and, unique in Philippine history, had (via Skype) a publicized sympathetic talk with the presidential candidate. During the same period, the NPA released several POW’s to Duterte, further bolstering his claim he would be able to reach a peace agreement with them. All this helped create sympathy for Duterte among the National-Democratic mass base. This violence did not come as a surprise. From the late eighties on, Duterte was the mayor of Davao City. Long before he became president, he organized a death squad that murdered hundreds, mostly petty criminals, drug addicts, and street children. Despite this, Duterte and National-Democratic leaders cultivated cordial links. The total death count of Duterte’s “war on drugs” is in the thousands and is still increasing. Sison carries part of the responsibility for this. The international left should support Philippine leftists when they are threatened by the state or by the NPA. During the latest protest on the occasion of Duterte’s State of the Nation Address, different groups, including above ground allies of the ND’s, mobilized together. Among younger activists, there is a chance to spread a more pluralistic culture. As an international left, we need to support this development instead of turning a blind eye to crimes committed by the CPP.